Meet Montgomery, nicknamed Monty. 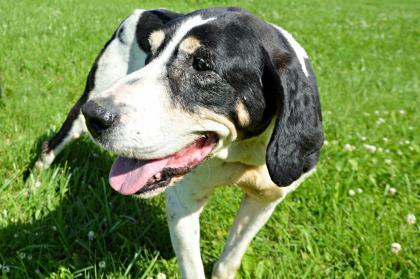 He's a 10 year old senior purebred Coonhound dog who has found himself in a shelter. In fact, he's been in a shelter for a very long time. First in a rural shelter and now at Wayside Waifs in Kansas City. He may be a 10 year old senior, but he's still got some pep and energy, plus a whole lot of loving to do. Please share him and help find him a home for the holidays. Hi there, I'm Montgomery, or Monty, as many of my good friends like to call me. I am one special, precious, sweet dog, filled with love and ready to be part of a family. My life has been sort of rough lately, but I will never let that get me down. Nope. I'm filled with faith that my family is out there for me, searching for me, ready to give me the good life. 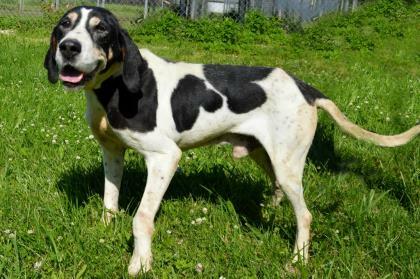 I'm a handsome, 10 year old, 64 pounds of pure sweetness, purebred Coonhound. I keep my kennel very clean and I know to go to the bathroom outside, so with a little patience from you, I'm sure I will pick up on housetraining quickly. I've been in a shelter for a very long time though, so please be gentle with me and give me a little extra time to get into my new routine with you. I came to Wayside from a rural shelter in Kansas and I had been at that shelter for so long. The volunteers there loved me and hated to give me up, but they knew my best chance for my happily ever after would be at Wayside. So here I am! Sometimes I get passed by because of my age or because I'm being treated for heartworms. Well, I'll be past this heartworm nonsense in no time and I don't mind staying calm and quiet for a few weeks while the medicine does its thing. As far as my senior status, I feel that age is just a number and I've got plenty of living left to do! I love to run and play and explore and stay active. And besides, none of us knows how long we have left on this earth, so the key is to appreciate each and every day. I'm very good at that! I love people! I like to stay close and soak up any attention you will share with me. I want so much to live indoors with you and be part of the family. I'm anxious to please you and I'll make a wonderful companion. I'm perfect at just hanging out and chilling with the family. I'd like to meet everyone before we all go home together, including any kids or other dogs you have. I'm looking for a sort of quiet and calm home, but older kids and laidback dogs might be a good match for me. I love to go for leisurely walks with you and show off my hound nose. It feels so good to be by your side and feel your pride as we walk through our neighborhood. I just want to belong to a real family. I want my golden years to be the best years of my life. I want to make your life better, just by having me in it. I'll do my best to make you happy every single day for the rest of my life. I can't wait to get started! 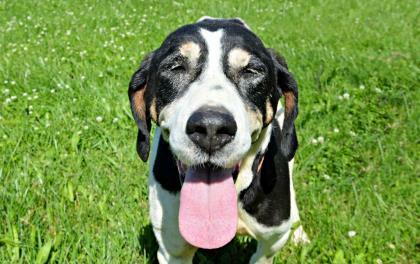 For more information about Monty, contact Wayside Waifs at 816-761-8151. His adoption fee has been reduced to $25.